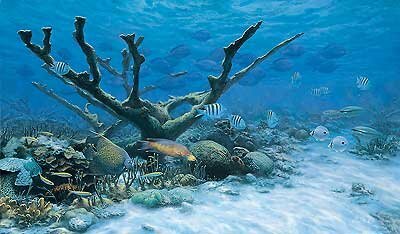 "The coral reef is a complex ecosystem. Dependent on sunlight, each coral is a colony of animals known as a coral polyp. As the corals grow over the years, they form massive reefs, providing shelter and nourishment to numerous invertebrate and fish species." Image size, 17" x 29".